Driving through Colorado is always nice, especially on some of my favorite routes like Route 50 that wind through the mountains and offers incredible vistas. Today’s drive was mostly I-70 but the western part of I-70 in Colorado is one of the nicest Interstate stretches in the country, so I don’t dread it as I do other stretches of the highway. Eleanor was driving the first leg from the Colorado River in Utah when we heard some squeaking from the hitch. Now that she’s in the driver’s seat, she’s attuned to the little things that formerly she wouldn’t have noticed. This sound was a familiar one to me, indicating that it was time to add some grease to the hitch ball. On a Hensley hitch it’s a little tougher to access the hitch ball, so I’ve worked out a technique, which I demonstrated for Eleanor. I’ll put that part indented here so those of you who don’t care can skip ahead. Basically you leave the trailer hitched to the car so that the car supports the heavy part of the Hensley for you. You do this by loosening the weight distribution strut jacks, then the hitch head struts, then disconnecting safety chains and 7-way cable, and releasing the hitch coupler. With the power tongue jack it’s simple to lift the upper part of the head up and off the ball. The lower part of the hitch stays with the car. I put in a pair of disposable gloves for the next part. You just squirt some heavy grease on the ball and work it all over with your fingers. 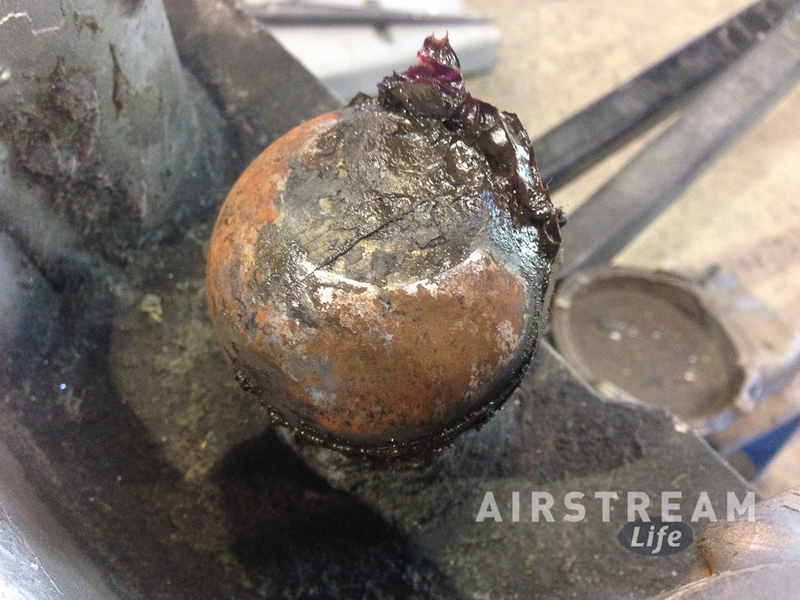 A thick coating on the ball is best, so that some of the grease coats the underside of the coupler too. Note in the photo there’s a distinct (rusty) band along the upper front of the ball where the grease tends to get squeezed out by pressure. This is where you need to apply the most grease. If you let it get dry, the chrome on the ball will be quickly worn off and the ball will be prone to wear (spalling) and rust. Once greased, lower the power jack back down until the ball is reseated, and reconnect everything. The trick is to count the number of turns you loosen the hitch head struts, so you can tighten them by exactly the same amount. This keeps the head in alignment with the trailer, so you don’t have the trailer pushing the tow vehicle sideways when braking. With that job done (in a pullout, in about 5 minutes), we had a very pleasant drive through Colorado. But along the way we discovered a real problem. The refrigerator had mysteriously switched off during the night (with a “CHECK” light indicated on the control panel) and we had re-started it before we left. At one of our stops we found it had gone off again. When I restarted again I could hear the gas flame making a lot of noise, like a rocket launch, sputtering, and going out frequently. Uh-oh. Time for some diagnosis before our Klondike bars melted. Now, normally I would pull out my copy of “The (Nearly) Complete Guide To Airstream Maintenance” for some help, but since I wrote that book I already know that this particular problem isn’t covered. I made a mental note to add this situation into the next edition. The flame looked pretty good on the refrigerator when it was burning, but it kept going out. So the process was to figure out whether the problem was in the refrigerator, the regulator, the lines, or the gas tank. Switching tanks didn’t seem to help. The regulator was newly installed in January and looked perfectly clean. I couldn’t check the gas pressure because I left my manometer at home, but I could light the stove and see that the flame looked good—and to add to the mystery, the furnace ran without a problem. I crawled under the trailer and inspected the gas lines for damage but they were perfect. Even the refrigerator was new in January, so I was really mystified. The gas valve on the refrigerator was failing. The gas jet on the refrigerator needed adjustment and/or cleaning. There was some sort of contamination in the propane that was intermittently clogging the jet on the refrigerator. At this point on the drive, I couldn’t do more, so I coaxed the fridge into running simply by resetting it (power cycling it) many times until it finally seemed willing to stay lit. Now, if I had been thinking about the refrigerator later in the drive we probably would have opted for a campsite with electricity so that the fridge could run on electricity instead of gas. 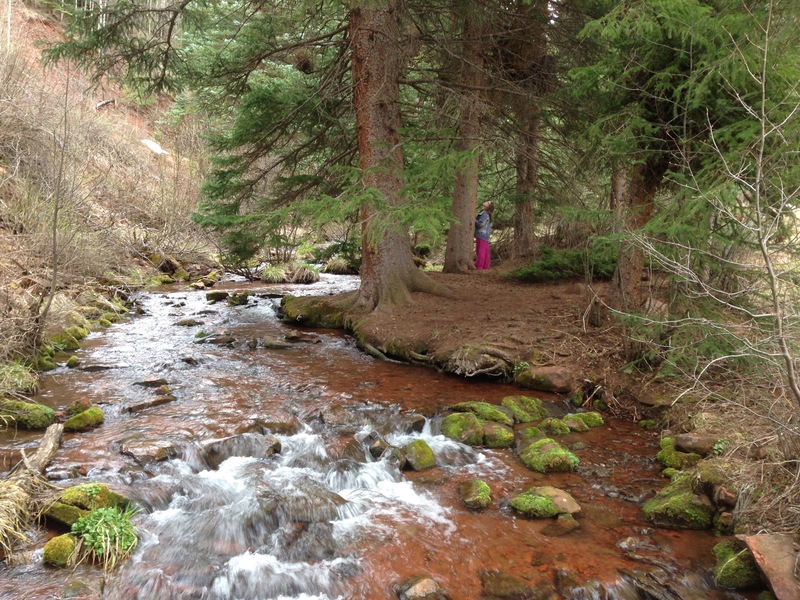 But we forgot all about it and decided to drive up to remote Sylvan Lake State Park, near Eagle CO.
I’ll post a review of Sylvan Lake on Campendium later so you can get the details about this place, but right now all you need to know is that it’s beautiful and isolated. Zero cell phone service, which meant that when we arrived and found the refrigerator off again, I couldn’t call my usual brain trust for ideas. Also, the climb up to Sylvan Lake is 2,000 feet of elevation gain above Eagle, the last 4 miles or so are rough, potholed red dirt road, and towing above 10 MPH was not possible most of the way. So we were fairly committed once we arrived. A thunderstorm had just left the area, but not before pelting Eleanor with sleet and small hail as she directed me into the campsite. The temperature up at 8,500 feet was a mere 46 degrees. It was not the most inspirational start, but once we got settled in we discovered what a lovely place Sylvan Lake really is. We took a walk around the lake (about 2 miles) and threw some snowballs at each other, and eventually we were glad we’d made the effort to be here. Back at camp, the refrigerator still had problems, and we discovered the water heater wasn’t too happy either. This narrowed my theory to one: gas contamination. The appliances with tiny calibrated gas jets (water heater and refrigerator) were having trouble dealing with the gas, while the less fussy appliances with big jets (stove and furnace) were fine. I’ve read about ways that propane contamination can occur, but since I’m writing this in a no-Internet zone I can’t study that subject right now. As I recall, the solution is to have the propane tanks purged. I suspect the problem to be from only one of the two tanks, since I had one filled this week in Tucson and we were not using that one when the problem appeared. For now, we are burning propane only from the Tucson tank and hoping that the contamination in the lines eventually works its way out. I’ve had to reset the refrigerator several times since last night (most notably at 1:10 AM) and it’s still intermittently shutting down, but with luck we can limp into Ft Collins later today without a complete ice cream meltdown and at that point we can switch to electric cooling while I find a propane service center in town. the refrg works on electr…just use the inverter while towing. all the hours of driving will keep refrg ok. with outside temps at 46 the refrg should not struggle. the orfice might be # 58 size. easy to clean, maintain. with good battery…………should be able to keep refrig perfect. use an extension cord to power refrg from an inverter source. Sorry, Peter, that won’t work. The refrigerator pulls a whopping 30 DC amps while running through the inverter on AC power (part of that is the inherent efficiency loss caused by the inverter itself). The amount of charge we get from the tow vehicle is much lower than most people think, typically about 1-2 DC amps. Even allowing for the refrigerator’s electric heating element cycling on and off, the net loss would be roughly 20-25 DC amps per hour. 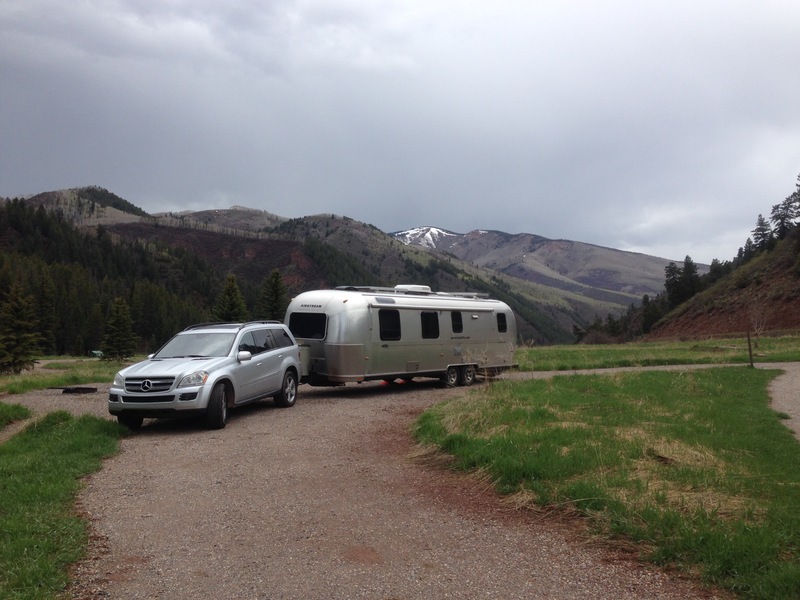 Most Airstreams have a two-battery bank of about 85 amp-hours (usable), and no solar panels. Assuming fully charged batteries at the outset and no solar, the fridge would use up the batteries in 4-5 hours. In our case, with a much larger battery bank with 127.5 amp-hours usable, and roofop solar producing (optimistically, in full sun, perhaps 8 amps), we might have gotten further than a stock Airstream. But we didn’t start with a full battery. After a night of boondocking with furnace, microwave, coffee pot and other use, we were starting with only 61% of our usable capacity (=77 amp hours). So we would have run out of battery power in a matter of perhaps 4 hours even while towing if we’d tried to run the refrigerator on AC power during our tow. Thanks for the Campendium mention. I hope your propane issue is resolved soon!